Conventional gardening does have its issues, like the space it takes, the clumsy arrangement of your plants and even the limited time when to start your garden. Vertical garden kit or the tower garden system is an ideal alternative and also one of the hottest trends in gardening. It is a new concept in raising fruits and vegetables using limited spaces but maximizing output by growing plants on the vertical. Furthermore, tower gardens can be grown indoors as well as outdoors. And because the area it requires is so minimal, working on your produce will not be so taxing and expensive. As should be expected, this vertical garden kit is a space saver and is ideal for herbs, succulent veggies, strawberries and more. It is composed of five tiered stackable plastic pots which can be dismantled and used individually if so desired. But that would be defeating the purpose of tower gardening. Stock it up, grow your favorite plants vertically and watch an excellent and amazing garden grow in a short period of time. The set includes five stackers, twenty planting locations (with four pockets on each layer) and one bottom drip tray. The tower is made of Polypropylene which is food safe and non-toxic material. Each layer is designed with its own water reservoir and draining grids so you need not worry about over-watering your plants. The drip drain is designed for convenient self-watering. Just simply water the top layer and the water will trickle down to the lower pots. This feature alone makes gardening so easy. The tower is also flexible in case you decide on hydroponics (hydroponics is the method of growing plants without soil, using mineral nutrient solutions in a water solvent). Just inquire from your tower sales representative on how to setup this option. Some vegetables are seasonal but with the garden tower, you can grow them the whole year round whether it be indoors or outdoors. Flowers, berries, and herbs can be grown all at the same time. Owning one will certainly elicit your enthusiasm in gardening. And even for your children, they should be encouraged to join in this new adventure. When grown indoors, the herbs could serve as air fresheners, the gorgeous flowers can make each day a special day and the fruits and berries can make for a healthier diet. Allow you to grow different plants more efficiently, saving you water and space. Made of Polypropylene, which is a food safe material. This vertical garden kit is also composed of five (5) tiers which can be separated into two, one two and one three tiered planters when so desired. You can use one for herbs, the other for berries and they could be placed in different locations. This tower is made of flexible, lightweight, long-lasting and food safe material. For watering, it uses the trickle down design, where water is poured on the top tier and this trickles down to the lower tiers. This assures the prevention of overwatering which can cause root rot. This tower is also flexible enough if you decide on hydroponics. Consult your sales representative on how to set up this option. One of the great features of this tower is its cheap price. Compared to other planters, it is a bargain. Aside from its price, it has all the features which can attract would-be customers. It can grow up to 20 plants in a very small space and extra stackable layers are available if there is a need to expand. It is very easy to assemble and it is a freestanding unit that requires no support (although it is advised to have it secured to the ground); it can be used indoors or outdoors. With the latter feature, you will have the potential of having seasonal fruits and herbs all year round. With the cheap price of this vertical tower, you can afford to purchase more than one. Impress your neighbors and your guests, at the same time doing yourself a favor with: herbs for the kitchen, fruits for your health and flowers for your decors. Get your tower now and learn how to "tower garden" efficiently. Can be placed anywhere inside or outside your home. Made of flexible, lightweight, durable and food safe materials. Can be used with different kinds of plants. 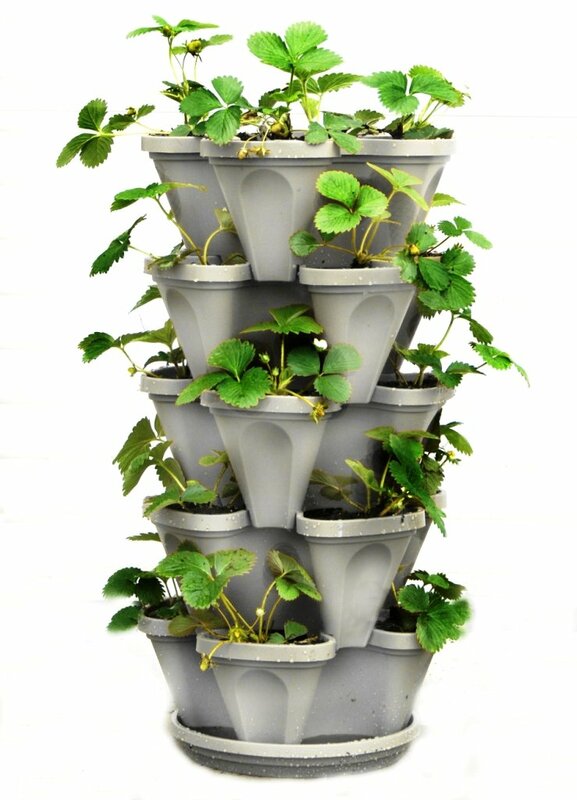 These vertical gardening towers are used mostly by commercial growers and by universities. They are made of really durable materials (Food Safe High-Grade Polypropylene #5) which are flexible and lightweight and made to last for long periods of time. An option for greater support is the addition of a center pipe. It also has drainage holes for the top-down design for watering. It can allow up to 20 plants. This garden tower is extremely easy to assemble and use. Just assemble, plant, stack, water and watch the miracle happen. Like almost every tower planter, it uses the easy top-down watering design. Although used often by commercial growers, it can also be used at home with the same results. 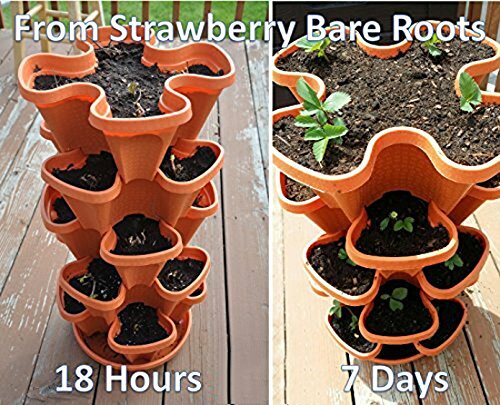 Extremely easy to use - just plant, stack and watch them grow. Designed to make watering easier. All you have to do is water the top pot. Suitable to be placed in any kind of home or establishment. Allows you to have up to 20 plants. Vermicomposting needs to be defined in this next vertical garden tower kit model. This is the process which uses earthworms to increase the speed of the composting process and ensure higher-quality compost. The end product is called vermicompost and this is a natural organic fertilizer. 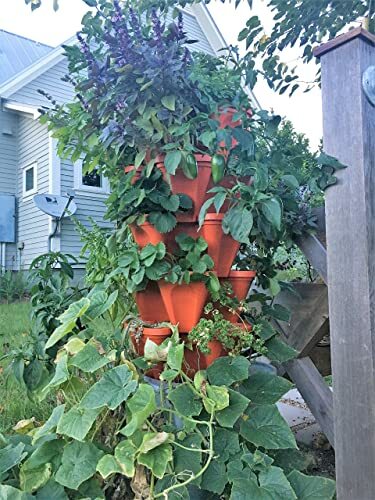 The Garden Tower 2 is a much larger model which utilizes about six (6) cubic feet of potted soil and allows up to fifty (50) plants to vertically grow in a small space. This tower is made from 100% recyclable, food grade, BPA free, high impact HDPE. Because of its defined space, gardening is made easier because its structure eliminates the need for weeding, electricity, nutrient and water loss that are associated with the usual methods of gardening. Even a neophyte gardener can manage this with ease. 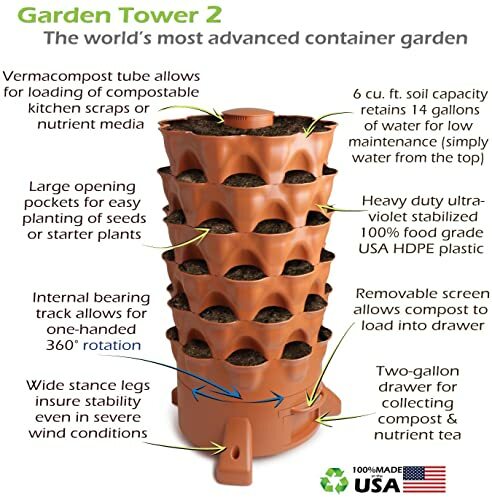 The structure and requirements of the Garden Tower 2 are pretty much the same as those previously discussed except that it's bigger in size and that it adds vermicomposting as its special feature. It needs about 1.3 square meters of flat space area. Just imagine a garden patch right in your own home. It only needs to be exposed to sunlight (or from growing lights) for about 4 to 6 hours a day for plants to generate their own nutrition. At the vertical center of the tower is a tube where compost worms (earthworms) are placed which is nourished daily with food scraps from your kitchen. In return, the worms produce castings. This is a dark compost that is a super-fertile nutrient which will be used in nourishing your garden tower plants. Furthermore, your organic waste is recycled to produce your own organic fertilizer. Talk about being eco-friendly. Allows you to grow up to 50 plants. Easily grow flowers, herbs or vegetables in this garden tower which rotates. This composter turns your kitchen scraps into organic compost for plants. Comes with a warranty from the manufacturer which is good for 5 years. 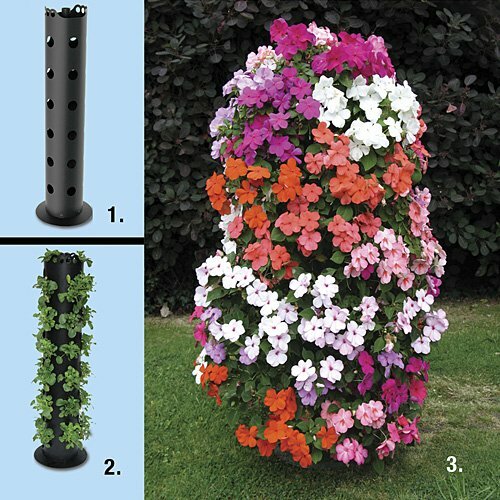 The last product on our vertical garden kit review, this flower tower was designed specifically for growing flowers. It is a freestanding vertical planter which can accommodate up to thirty plants. In full bloom, the Flower Tower is certainly a great way to display your flowers anywhere indoors or outdoors. It is also a great space saver. Its watering system is unique in the sense that its internal water tube has graduated sized holes at various heights which allow for easy and even watering for all plants from top to bottom. Although small, the flower Tower in full bloom is a stunning display of colors. Adorn your patio, your deck, your balcony with this tower and impress your friends. Also, be reminded that its use is not limited to growing flowering plants. Tomatoes, berries, and herbs can be raised as well. This flower tower will create a beautiful column of blooms for your home. Made with polypropylene material which is recycled but long-lasting. Allows you to plant up to 30 plants. Has a built-in watering tube which reaches all the plants. Surf the internet and you will discover tower gardens that will cater to your budget. Decide the soonest and start growing your own herbs, fruits, and veggies. If you are inclined to more expensive brands with additional features, you'll get covered with this as well. What number can the planter allow for a certain plant? Is the planter large enough for a certain plant? Weigh in on these factors when making your choice. Consider your space. A big planter may prove to be inconvenient for small spaces. Furthermore, its weight makes a big planter hardly portable. Because of its affordability and availability, manufacturers are inclined to use plastic. Their light weight makes them convenient to move around and are usually less dense compared to other materials. Polypropylene is durable and also food-safe but heavier than plastic. Wood has its appeals to organic followers but is heavy and do not last as long. Vertical garden kits can either rest on the ground or can be suspended. Those of the latter kind are ideal for small spaces. Either way, the concept design of tiered planters is for maximizing output on limited spaces. Also, consider the weight of your chosen planter. If you plan to move it regularly, it could be a cumbersome task doing so. Depending upon this, choose the planter that would make life easier for you. Whatever the situation is, choose a planter that would perform well as needed. If you are a herb enthusiast, a lighter and smaller tower would suffice and you will have the advantage of easily moving the tower around. For fruits and veggies, maybe a larger one and at the same time allow more plants grown. But they become a pain when moving them. 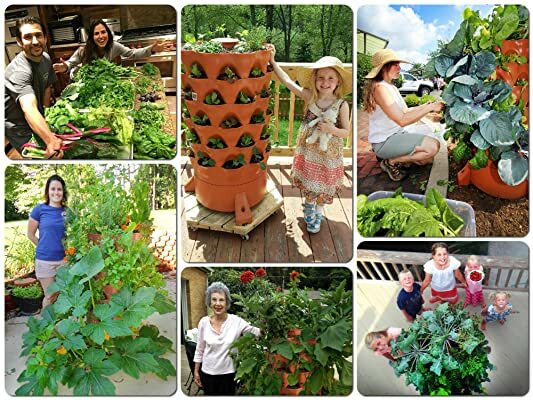 From the best tower garden review, you will see that there are a lot of different options. Some brands come with extra features while some brands have a requirement that the planter is placed in a sunny spot in the house so they can blossom on their own with the least intervention. As you can see in the Vertical garden kits garden reviews, there are a lot of options to choose from. For a limited amount of space, a vertical garden kit will allow you to grow different plants. Flowers, herbs, berries and some vegetables can all be grown at home, indoors or outdoors, and in as less as three square feet space. Aside from this decorative value, the fruits of your tower can lead to a healthy organic living. Vertical gardens are nourished only with water and nutrients. No dirt involved. Through research, it has been proven that tower plants grow three times faster than conventional ones and produce 30% more on average. If proper attention is provided, this will result in an abundant and nutritious harvest just after a few weeks of planting. The usual problems of conventional gardening which include pests, diseases and weeds can be eliminated with Vertical Garden Kits because water and nutrients are automatically delivered where they're needed most. With proper nutrition, you get healthy and strong plants with the least effort. And this kind of sturdy plants usually develops greater resistance to combat pests and diseases. As such, you won't need those deadly pesticides. Dealing with weeds is minimized as well. 90%:10% is a significant ratio for tower gardens because it uses only 10% of the conventional garden surface required to grow the same number of plants. This also applies to the water requirement, a mere 10% and a perfect solution to drought conditions. This is all possible because of its vertical compact design and closed-loop technology. Place your towers on small sunny spaces such as patios, balconies, rooftops. If indoors, provide the plants with grow lights. Aside from its aesthetic value, they are also good for your environment. In full bloom and positioned well, Tower Gardens are truly works of Art. Try hanging them vertically and innovate. That should elicit fun and creativity. As you read through our garden review, you would have seen that they are space savers. Limited space is where Tower Gardens can thrive well, especially in urban settings because of its vertical feature. Living in limited spaces inhibits them from conventional gardening. For city folks who desire fresh produce on their tables, vertical gardening will be their best option. Too many potted plants will result in cluttering and will eventually lead to crowded spaces. Because of their vertical feature, vertical garden kits will conveniently solve this problem. Imagine twenty individually potted plants all organized in one tower. No wonder minimalists now prefer this vertical garden concept. Providing cleaner air is a health benefit of Tower Gardens because plants have a tendency to collect and show dust. When vertically grown, they collect less dust and consequently are easier to clean. Furthermore, plants use carbon dioxide to process their food and release oxygen as a by-product. And we all know how important this gas is in our lives.